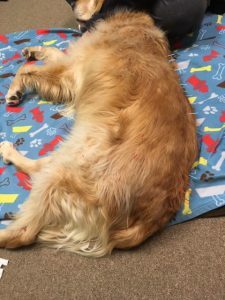 A 95 pound, 6-year-old, neutered, male, Golden Retriever was presented for evaluation due to pain and dysfunction consequential to mild, bilateral canine hip dysplasia and early lumbosacral disease. Acupuncture was chosen as part of an integrated approach to pain management. After a six-week treatment plan, pain was resolved and normal function was restored, but not all problems were resolved. 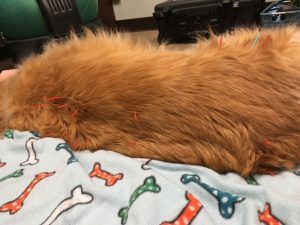 The patient was presented to the referring veterinarian (rDVM) on October 22, 2018. The initial owner complaint was “excessive panting and breathing heavier than usual”. Additionally, the owner stated that the patient did not want to jump into her vehicle. Initial examination of vital signs by the rDVM were as follows, weight: 95.7 pounds, temperature: 101.5 F, heart rate: 135, respiration rate: pant, capillary refill time: less than 2 seconds, body condition score: 7/9. The musculoskeletal evaluation found “pain/resistance on extension of right hip/stifle”. Neurologic evaluation found “spasms/sensitivity on palpation of the thoracolumbar spine”. All remaining parameters were found to be within normal limits. The rDVM’s assessment for the right hip/stifle was pain secondary to such problems as canine hip dysplasia, partial tear of the cranial cruciate ligament, neoplasia and other unnamed problems. 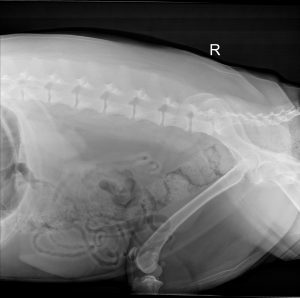 The patient was sedated for radiographs (spine, pelvis, right pelvic limb). 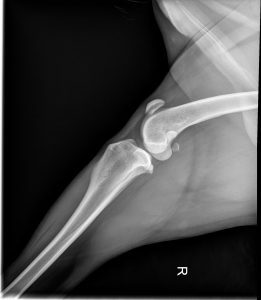 The rDVM’s radiographic interpretation included “diminished right coxofemoral coverage, mild thickening of the right femoral head/neck” which may have been consequential to early canine hip dysplasia. The right stifle was found to be within normal limits (no cranial drawer sign/laxity noted on palpation under sedation). Adequan was administered and patient was discharged with Deramaxx 100 mg ½ tablet orally once daily and one bottle of Adequan for at home administration, 1.9 ml subcutaneously twice weekly for four-weeks then administered once monthly. The patient was presented to the rDVM for a second time on November 2, 2018. The owner’s presenting complaint at this time was that the patient was “depressed”. He typically loved to go on walks, attend day care, and ride in the vehicle. Upon arriving home after any of these activities the patient “seems happy but then looks sad when he lies down”. The rDVM discussed performing bloodwork to rule out any systemic diseases and again, reviewed previous radiographic findings with the owner. \The complete blood count, blood chemistry profile, electrolytes, T4 and 4DX tests were all within normal limits or negative. However, the urinalysis revealed a bacterial cystitis. Cefpodoxime 200mg 1.5 tablets orally once daily for 14 days was prescribed. The rDVM recommended referral to P.A.W.S. for Rehabilitation for evaluation. INITIAL EVALUATION November 27. 2018. 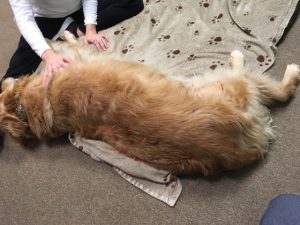 A 95 pound, 6-year old, neutered, male, Golden Retriever was presented for evaluation. 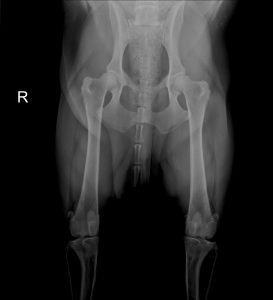 Radiographic review: right stifle: within normal limits, spine: signs suggestive of early lumbosacral disease (L/S disease), hips: upon enlargement, signs suggestive of mild canine hip dysplasia. A radiologist’s interpretation was not available for review. Vital signs and general physical examination were within normal limits. Current Medications include Deramaxx, Adequan, and Cefpodoxime. The patient’s gait mechanics and overall lameness is grade 3/5 or consistently observable under all conditions, where 0/5 is normal or no lameness. There was no lameness observed in the thoracic limbs. In regard to the pelvic limbs the patient short strides with both pelvic limbs. He uses his pelvis instead of his hip to initiate the striding swing phase of the left pelvic limb, and he pulls his weight forward. There is a right rear leg lameness. The patient exhibits a shortened cranial stride involving the right rear leg and a shortened caudal stride involving the left rear leg. Additionally, he swings his pelvis to initiate the swing phase of his left rear leg. Gait 4 Lameness Score (GLS): In this scale normal weight bearing for each leg is 100%. Numbers greater than 100% represent compensation. Numbers less than 100% represent pain. 11.27.18: left front = 103%, right front = 105%, left rear = 91%, right rear = 95%. All postures and functional transitions are normal except for standing, where the patient shifts his weight to the left pelvis, stands with his pelvic limbs crouched and exhibits a sloping pelvis. There is a decrease in passive range of motion (PROM) in flexion of both carpi. All other goniometric measurements for both thoracic limbs are within normal limits. There are several compensatory muscle issues involving both thoracic limbs. There is a 2 cm variance in shoulder girth with the right shoulder being larger. Girth is thought to correlate to strength and use. All goniometric measurements for both pelvic limbs are within normal limits. There is tenderness and restriction on rotation of the right hip. There are several compensatory muscle issues involving both pelvic limbs including the left iliopsoas tendon of origin. There is a 2 cm variance in thigh girth with the left thigh being larger. Girth is thought to correlate to strength and use. There is bilateral tenderness T12 through L2 and L6 through S1. Additionally, the myofascia is restricted T12 through S1. All segmental reflexes, withdrawal reflex, conscious proprioception, and pain perception are within normal limits. 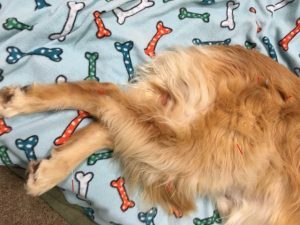 Mild bilateral canine hip dysplasia, lumbosacral disease, compensatory muscle issues, myofascial restriction, decreases in PROM, gait deficits, and pain. Using the mnemonic/acronym “VINDICATE the Myofascia”, considerations for a diagnosis would include but not be limited to; thromboembolism, discospondylitis, Lyme disease, Ehrlichiosis, Anaplasmosis, osteosarcoma, osteoarthritis, canine hip dysplasia, lumbosacral disease, immune mediated polyarthritis, immune mediated meningoencephalitis, intervertebral disc disease, cranial cruciate ligament tear or rupture, hypothyroidism, hyperadrenocorticism, hypoadrenocorticism, and possibly others. 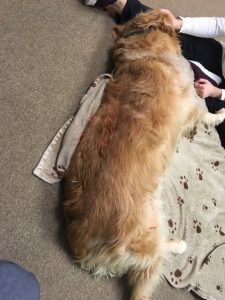 Taking into account the physical exam, blood work including the T4, 4DX test, radiographs, and the rehabilitation exam, mild bilateral canine hip dysplasia and lumbosacral disease become the most likely diagnoses. Patient needs from a rehabilitation perspective were to manage pain, address compensatory muscle issues, relieve myofascial restriction, increase PROM where it was restricted, normalize gait as much as possible and provide for weight loss. The patient’s series of treatments included: therapeutic LASER treatments, acupuncture, massage and neuromuscular manipulation, manipulative therapies-appendicular, underwater treadmill workouts and progress evaluations, therapeutic exercises, diet assessment and weigh in, and re-evaluation at the end of the six-week treatment plan. The medical acupuncture points selected for dry needling were GV14, GV20, Bai Hui, BL18, BL19, BL20, BL21, BL22, BL23, BL25, BL27, BL28, BL40, BL54, BL60/KI3, GB29, GB30, GB31, ST36, LR3. Treatments were provided once weekly for six-weeks. Treatments were alternated between left and right sides on a weekly basis. Cranial nerve and sacral nerve points were utilized to neuromodulate the parasympathetic nervous system. The remaining Bladder, Gallbladder, Stomach, and Liver channel points were utilized to neuromodulate the sympathetic nervous system. Additionally, local/regional points and distal points along the pelvic limbs were utilized to manage pain. Needle sizes selected were Seirin 0.20mm x 30mm or Seirin 0.16mm x 30mm. Photobiomodulation was provided twice weekly for the first three-weeks then once weekly for three-weeks. A K-laser, cube 4, with the available wavelengths utilized as follows: 660nm, 800nm, 905nm, and 970nm. Each treatment cycles through continuous wave initially then to super pulse and back to continuous wave at the end of the treatment. Settings were set for a light coat, canine, chronic condition, greater than 90 pounds. Parameters were as follows: bilateral hips: 2,194 joules, 13.0 watts, 2 minutes and 58 seconds, thoracic spine and lumbosacral junction: 2,194 joules, 13.0 watts, 2 minutes and 58 seconds each, left iliopsoas: 360 joules, 1.5 watts, 4 minutes Once the patient weighed less than 90 pounds parameters were as follows: bilateral hips: 1,872 joules, 12.0 watts, 2 minutes and 36 seconds, thoracic spine and lumbosacral junction: 1,872 joules, 12.0 watts, 2 minutes and 36 seconds each, left iliopsoas 360 joules, 1.5 watts, 4 minutes. Massage and neuromuscular manipulation were performed once weekly for six-weeks and were based on the rehabilitation evaluation of compensatory muscle issues and myofascial restriction with adjustments made upon re-assessment prior to each treatment. Appendicular manipulative therapies were performed once weekly for six-weeks on all four limbs and included, joint scouring, joint compression and distraction, grade I-IV joint mobilizations, and PROM. This therapy helps relieve restriction of the joint capsules, maintain PROM, treat compensatory muscle issues and relieves restriction of motion of the scapulae, as well as stimulate nerve fibers at the joints such as muscle spindle cell fibers, Golgi tendon apparatus, and mechanoreceptors. Underwater treadmill workouts were performed twice weekly for six-weeks and were utilized to increase strength and coordination and/or help improve balance and proprioception. Diet assessment/weigh in was performed weekly for six-weeks and was utilized to track patient weight loss. Therapeutic exercises were performed once weekly for six-weeks and used to teach targeted exercises to the owner for use at home on daily basis, with the goal of providing improved strength, flexibility, and coordination for the patient. Patient gait mechanics and overall lameness score improved from a 3/5 or consistently observable under all conditions to 0/5 normal or no lameness observed. All parameters were within normal limits except that the patient does not fully flex his knees. GLS: In this scale, normal weight bearing for each leg is 100%. Numbers greater than 100%, represent compensation. Numbers less than 100% represent pain. 11.27.18: left front = 103%, right front = 105%, left rear =91%, right rear = 95%. 1.25.19: left front = 100%, right front = 99%, left rear = 100%, right rear = 99%. All postures and functional transitions were normal. PROM in flexion of both carpi is improved but remains decreased. All other goniometric measurements for both thoracic limbs remain within normal limits. The compensatory muscle issues remain the same or are improved. Shoulder girth has decreased for both thoracic limbs. There is a 2 cm variance in shoulder girth with the right shoulder being larger. Girth is thought to correlate to strength and use. All goniometric measurements for both pelvic limbs remain within normal limits. Compensatory muscle issues remain the same or are worse. However, left iliopsoas pain has resolved. Thigh girth has decreased for both pelvic limbs. There is a 3 cm variance in thigh girth with the left thigh remaining larger. Girth is thought to correlate to strength and use. Restriction and pain on rotation of the right hip has resolved. No tenderness or myofascial restriction was noted on re-evaluation. All segmental reflexes, withdrawal reflex, conscious proprioception, and pain perception remain within normal limits. There was an eight (8) pound weight loss during the six-week treatment plan (the patient now weighs 87 pounds). For this patient not all problems resolved with a six-week treatment plan. Therefore, a less exhaustive second treatment plan was proposed with the goal of continuing to manage pain, address and relieve compensatory muscle issues, maintain strength and flexibility, and maintain a normal gait. Most likely this patient will require lifelong maintenance therapy. Performing adequate diagnostics and a thorough, integrated treatment plan provides the best approach for pain relief and return to normal function, as long as there is owner compliance. Lane DM, Hill SA. 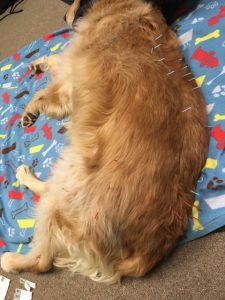 Effectiveness of combined acupuncture and manual therapy relative to no treatment for canine musculoskeletal pain. Can Vet J. 2016;57(4):407-14.